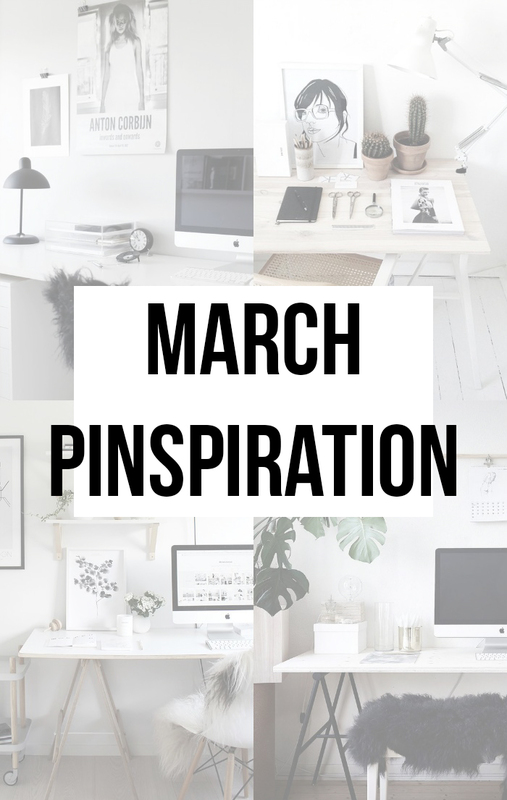 Throughout the month of February and this month of March I've really been getting into Pinterest, I've created numerous interior, fashion and little-bit-of-everything boards and I have to say I might just be a little bit addicted. I thought I'd share with you some things I've been loving off the 'ole Pinterest, and I warn you there's a lot of interior. I'll leave a direct link to all of my boards as I go through if you fancy a further nosy. I've finally persuaded my mum to let me paint my room all white, and since her decision I haven't stopped looking for bedroom ideas. 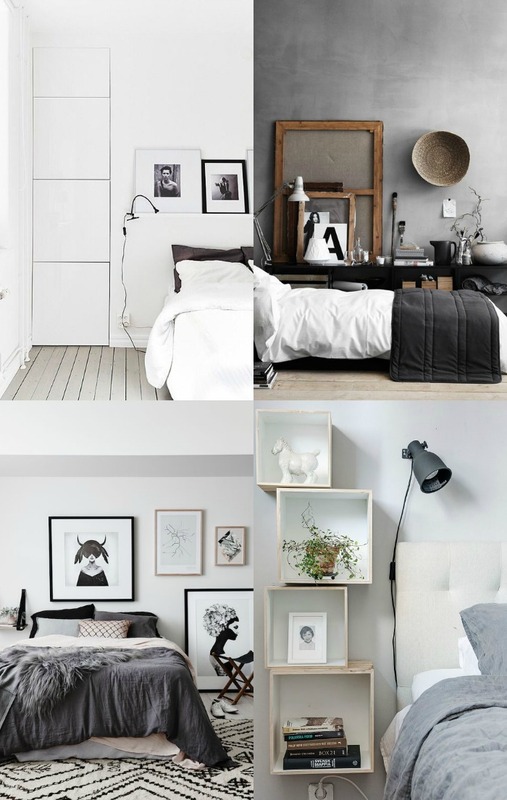 I've really been loving the whole monochrome theme, as well as the Scandinavian decor style that's taken over the internet as of late, I think a combination of the two would be perfect for what I have in mind for my bedroom. With a new bedroom comes a new workspace, again you can see I've been heavily influenced by the Scandinavian style and I wish that one day I can get my office space looking something like the above pins. 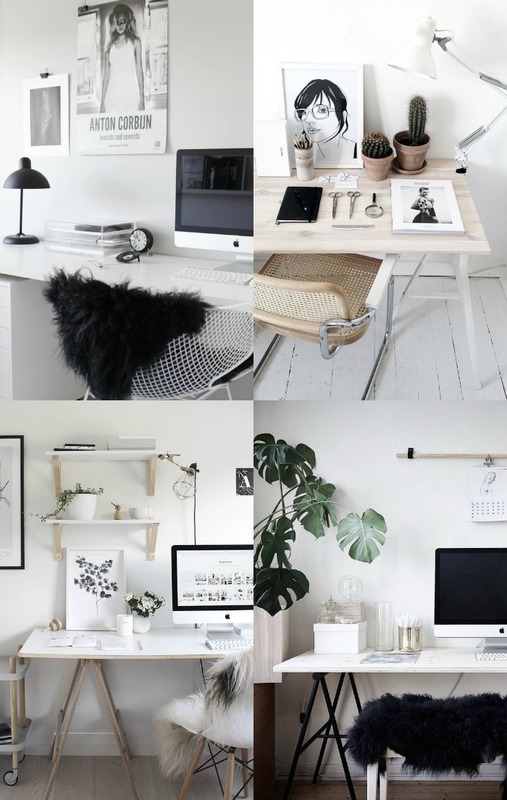 I love the combination of monochrome, light washed wood and greenery - dreamy. 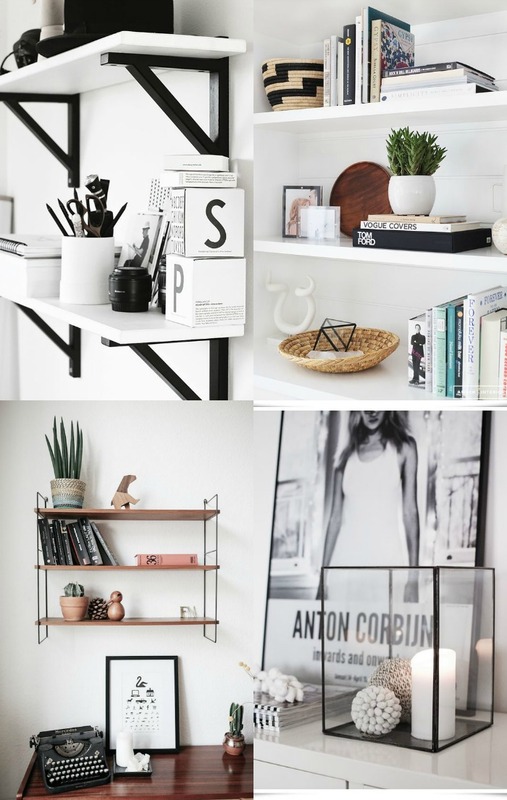 Because of the minimalistic vision I have for my bedroom, and future home in general, I think that details are so important in putting your personality into your space. I love these photos as they all contain little personal trinkets, whilst still remaining clean and chic looking. Oh how my heart weeps when I search for fashion photos on Pinterest; I almost hear my bank account shouting 'no, don't do it!'. The sad thing is that I know what sort of clothes I want to wear, and I know what sort of style I love, but my bank account will just not support it! 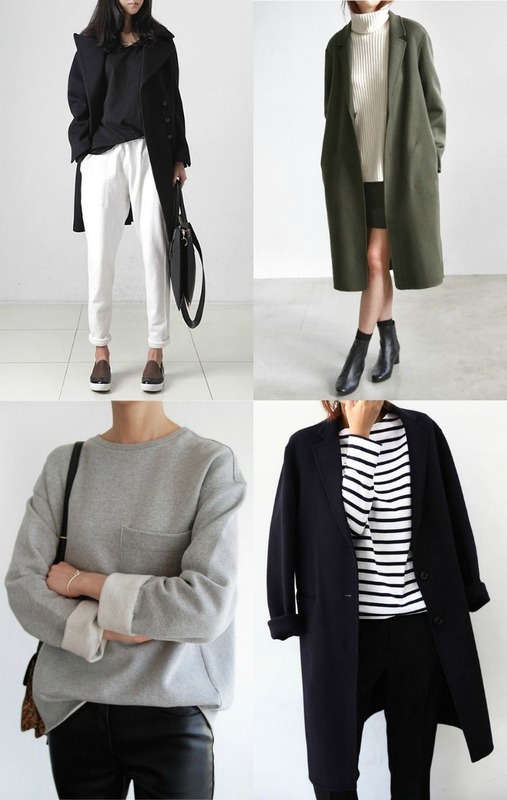 Even though it's getting into the spring, I'm on the hunt for the perfect longline trench coat, these can look so stunning over a summer dress or skirt - need! Oh y'all know this is my favourite part. 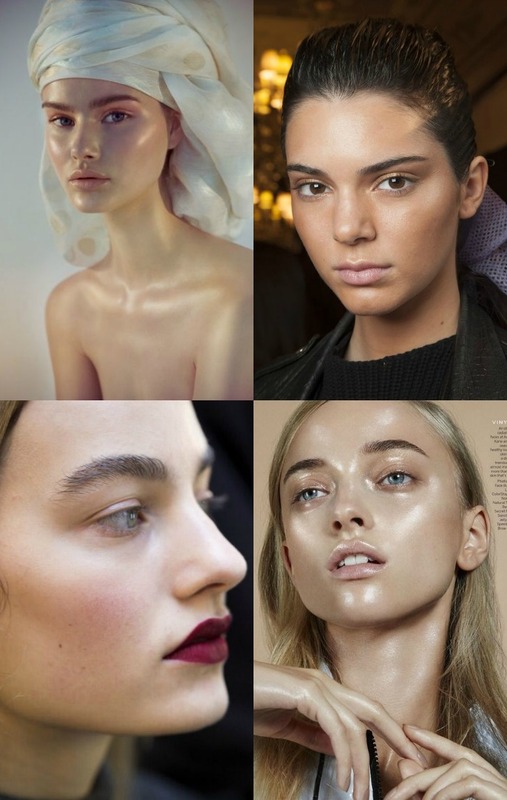 Some make-up trends I've fallen deeply in love with these past couple of months are bare eyes, bushy brows and bold lips; this is perfect for those who don't wear a lot of make-up as it's eye catching and beautiful whilst still remaining in your comfort zone. Another thing I've loved for the longest time now is Strobing. The photos above are clearly a little extreme as they're high fashion, but you get the gist. I love dewy, glowy, youthful looking skin and for me, the more I resemble a disco ball - the better. Today's post was short and sweet, but I wanted to share what I've been loving in the hope some of you may feel similarly! Leave your faves & your pinterest names below and I'll follow you!